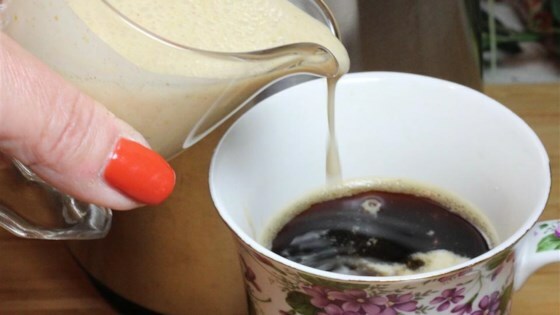 "The perfect creamer for fall! All of the good stuff and none of the fake stuff! Keeps in the refrigerator for one week." Whisk coconut milk, pumpkin puree, maple syrup, flax milk, and pumpkin pie spice together in a bowl; pour into a mason jar or container with a lid. Cover and gently shake before using. Store in refrigerator. The flax milk can be replaced with any non-dairy milk. This was very good. I left out the maple syrup since I didn’t have it and added vanilla extract to the mixture. I used Stevia to sweeten. Next time I think I will try honey or agave.